Antony says this of Cleopatra; I have often had the phrase, “her infinite variety” on the tip of my tongue here in Spain. Barcelona has become the mistress of many a traveller, I am sure. It is enchantingly beautiful, varied, filled with essential pleasures as well as those hidden in the corners. My memories of Paris pale in comparison. I went out to the outskirts today to what was built over one hundred years ago as an industrial colony. Catalonia was and still is an industrial and economic powerhouse. During the second half of the nineteenth century around one hundred of these colonies were built in the interior, making use of the hydro power for textile mills and to remove the workers from the powder keg of unhealthy overcrowding and political strife. Initially factory and housing for the workers, but step by step many of amenities of life were added; schools, churches, libraries, cultural centres, theatres, co-operatives, etc. Similar experiments took place in England and probably elsewhere. The most interesting is the one I visited today. A wealthy industrialist, Eusebio Guell, was the patron (also Gaudi’s major patron). 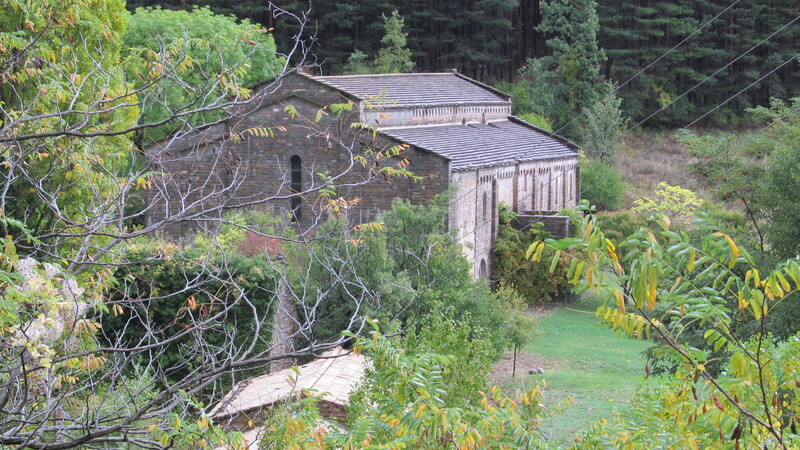 He moved his textile mill from the Dickensian slums of Barcelona to his farm on the outskirts and hired Guadi to design it, making use of the latest currents in architectural design. I am very unsure of Gaudi’s work. 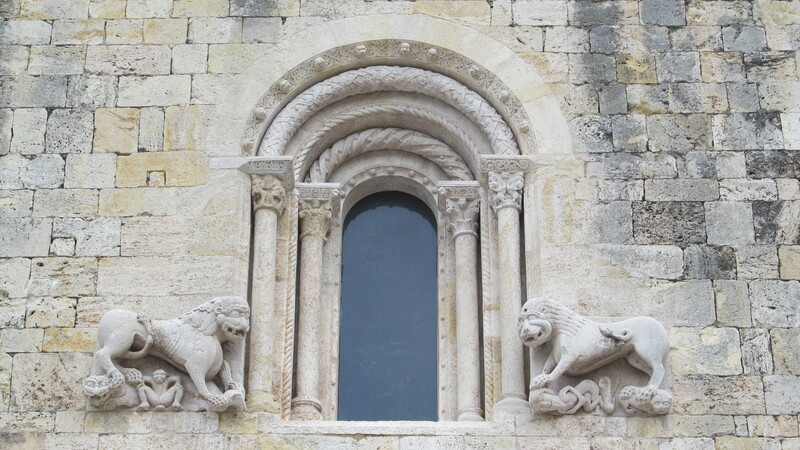 I am very moved by the simplicity of early Romanesque architecture. His Sagrada Familia would not look out of place in Las Vegas, over the top as we say. 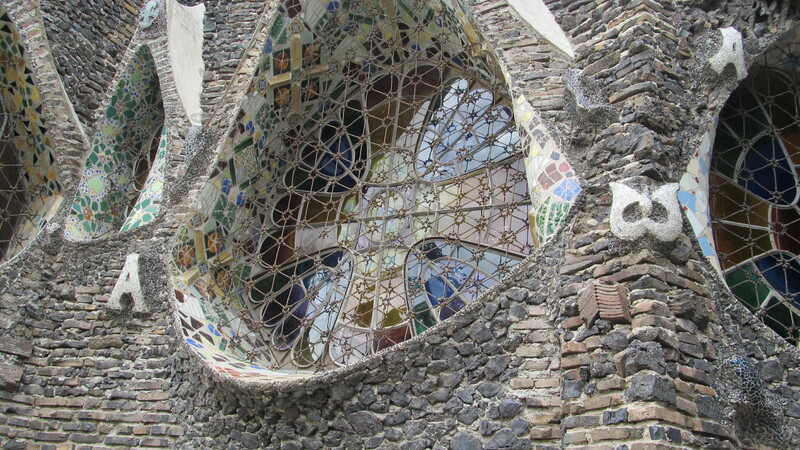 I do love his Parque Guell in Barcelona. <http://www.google.ca/search?q=parque+guell&hl=en&prmd=imvns&tbm=isch&tbo=u&source=univ&sa=X&ei=x–PUNqMHoi3hQeRuICwBg&sqi=2&ved=0CCgQsAQ&biw=1299&bih=755&gt; It is easy to google with those two words if the link does not work. My photos are at home. For the kid in all of us! 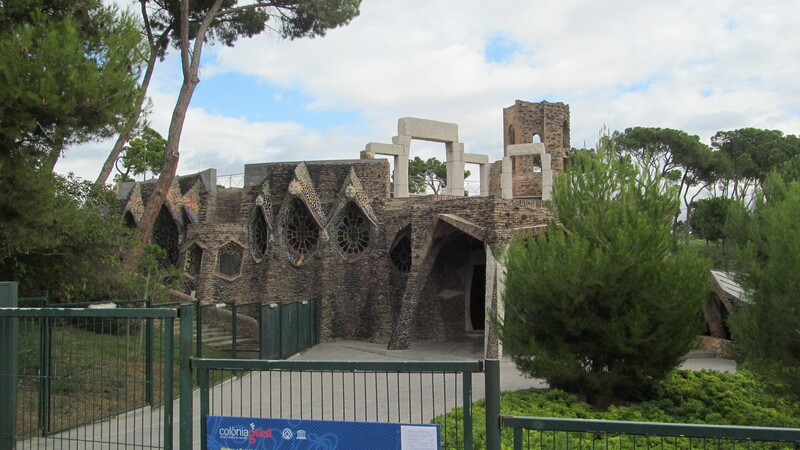 At Colonia Guell, Gaudi designed the church, but only its crypt was finished. Some renovation is going on. 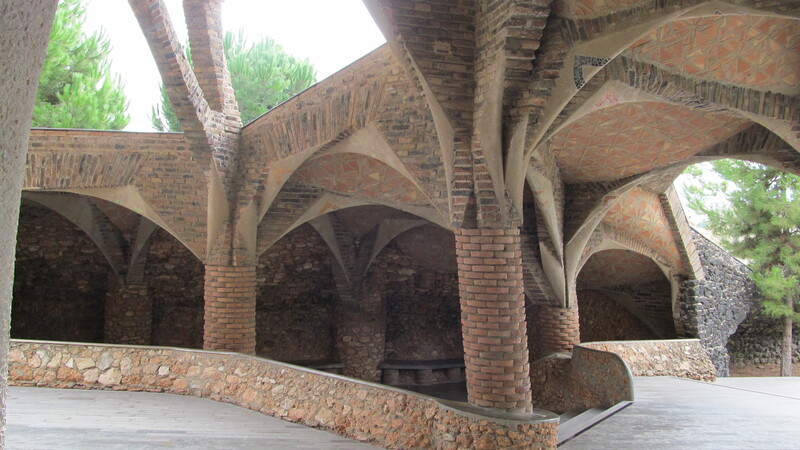 Reminiscent of the caves he created in Parque Guell. As a child, the natural world was where he spent every spare moment and as an architecture he sought to recreate the forms and designs of what he saw in nature in his work. His columns simply remind us that tree trunks do not grow completely straight. Every piece, every angle is the result of experimentation, as he struggled to arrive at the right combination so that the whole thing does not collapse. He felt that the Gothic flying buttresses were a cop out. 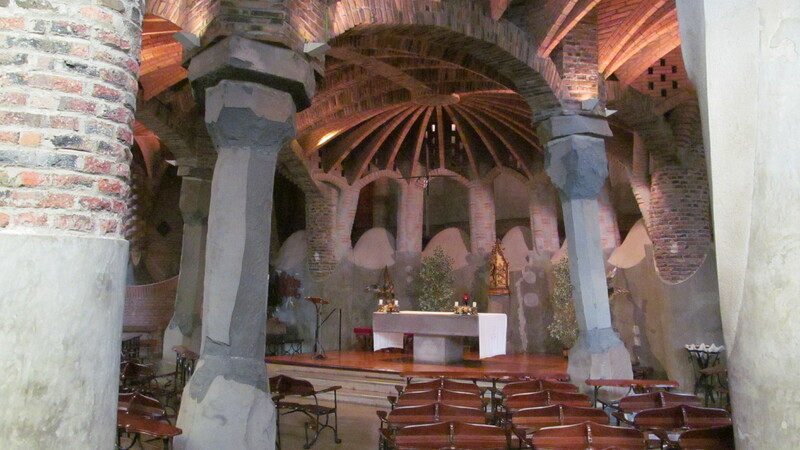 These ideas have been perfected in the much larger Sagrada Familia. He designed everything, including the pews and the windows. 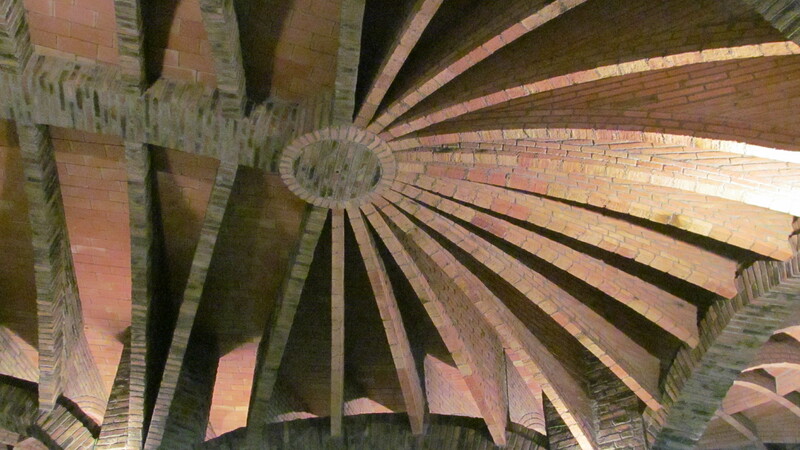 Every piece, every angle, for example, in the ceiling, is unique. In the next corner, it had inevitably to be done differently so that part of the roof stayed up. He saw the symbolic in every element; the ceramics (his designs again) in the window frame, each element has a meaning, and the window itself is framed by the alpha and omega, from the Book of Revelations. The building lacks uniformity; it breathes the variety found in the natural world. And I do so love the uniformity of Romanesque masonry! My favourite part is possibly this porch, on the front. Attached porches are very characteristic of early Romanesque rural churches. I have seen many; Gaudi would have been conscious of this tradition and of their integral role in communal life, a vital ‘third space’ as they say today in urban studies. I have scores of photos of this crypt, but the town is also of “infinite variety”, with many buildings designed by Gaudi’s colleagues. 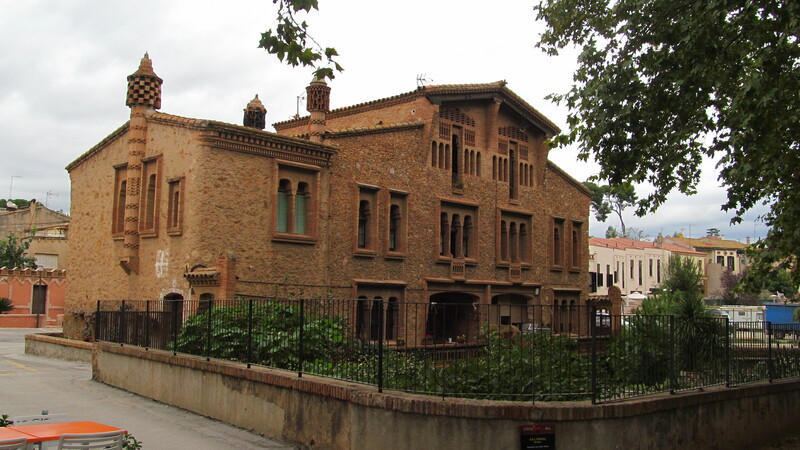 Here is Guell’s on site residence. And a residence in the middle of the town. Both full of whimsy. 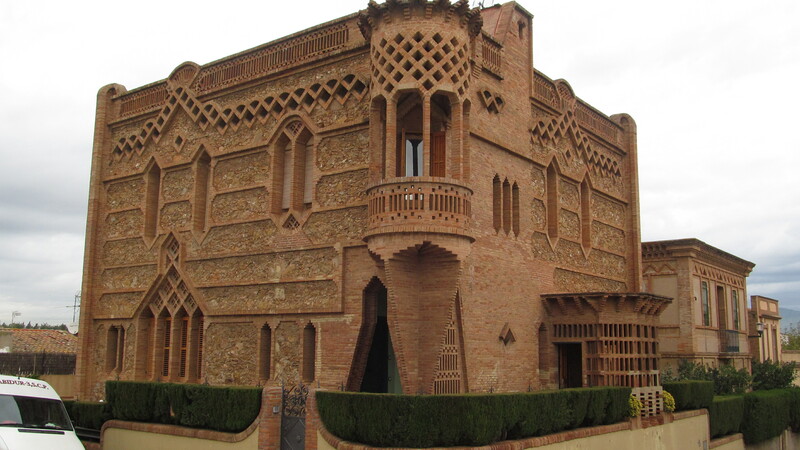 There was a conscious effort to forge a Catalan style using elements and materials used in the villages through the centuries, with medieval and mudéjar (Moorish) echoes. There is a sunken gardens here, the closest one filled with fig trees. You will easily be reminded of the late nineteenth century Arts and Craft movements, both in England and in the United States, as well as the work of Frank Lloyd Wright. Fascinating! Hamlet’s line, about an “undiscovered country” also floats through my mind when I am here. The world knows well Madrid and Barcelona, the beaches, and a bit more, but I am continually finding new treasures, secrets, charms and corners of this country. It is a joy to share them with you. Shall we charter a plane for next spring? This is an “undiscovered country”; I do come back to Canada, but will be drawn back to “feed my hunger.” I guess if Gaudi can be ‘over the top’, so can I. Enjoy. This entry was posted in Uncategorized on October 30, 2012 by agnotarte. I connected with the friends I met here in April, Duván and Alberto. The former is the very gifted artist who drew what I call ‘my Don Quixote’, at present gracing my living room. And today we went for lunch. And what a lunch! 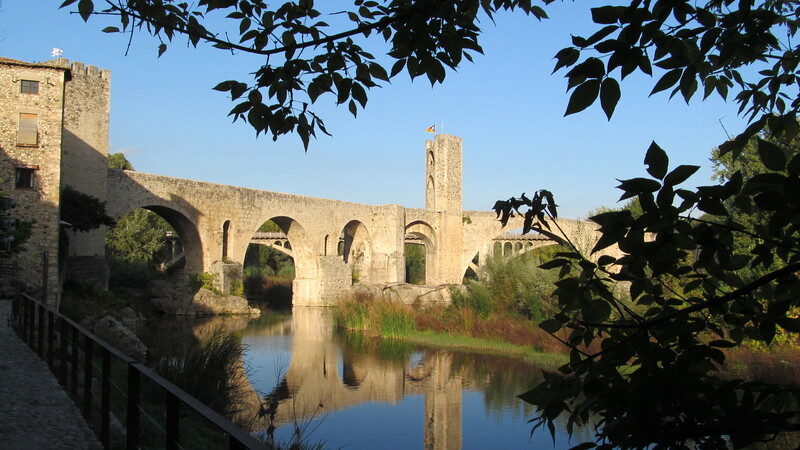 Besalú is situated in a valley surrounded by mountains about 35 kilometres from the sea, at an altitude of 150 metres. 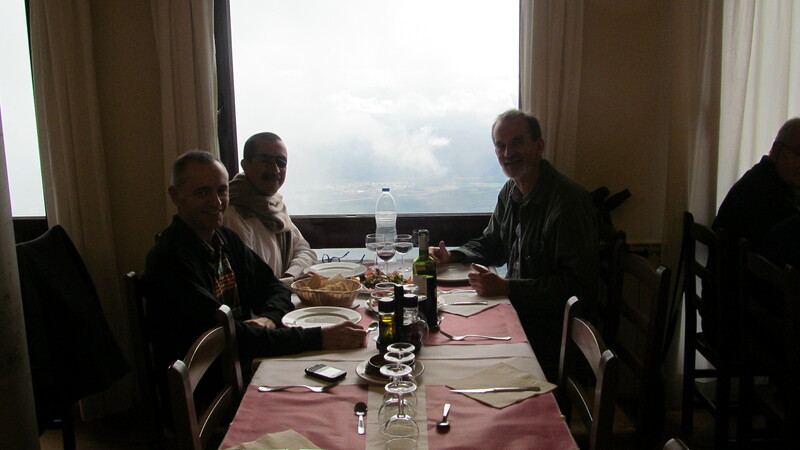 The restaurant was at the highest point of the highest mountain within sight, at 1200 metres. The road up was narrow, winding and ever rising. It was quite a challenge to deal with oncoming cars. So nice to be in the back seat for a change! How to choose among the photos; this one gives a good sense of the interplay of the elements from the summit. On a clear day we would have seen forever, but the mixture of elements made this day so memorable. 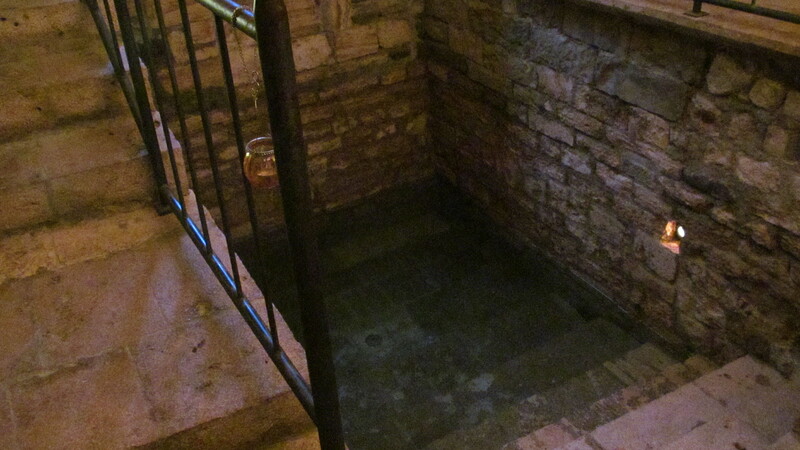 The restaurant is part of a hotel; the building itself was constructed in the 14th century – another monastery to get away from sin in all its wonderful varieties. Not the greatest photo because of the intensity of the light – it is more than a 1000 metres almost straight down. You can get a sense of our eagle’s nest and view of the valley floor through the window. The salad was delicious. 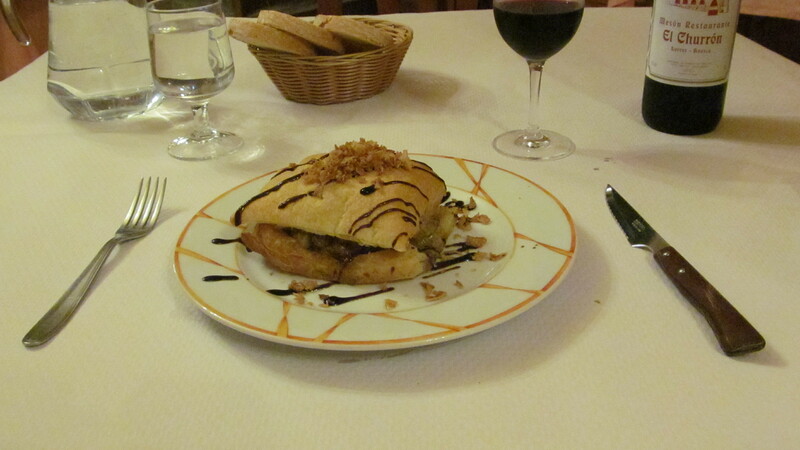 Then came the pièce de résistance – a risotto with wild mushrooms and fresh sausage – there is a theme emerging. Divino! Sabroso! Delicioso! Understandable in any language! Notice that the clouds have totally encircled the mountain top. The valley has disappeared. 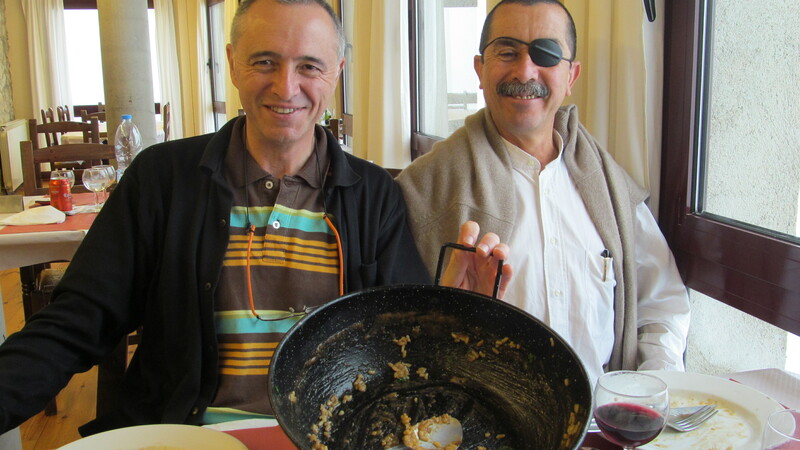 Assisted by wonderful conversation in Castellano, we did manage to finish the risotto, if there was ever any doubt about it – Alberto and Duván did help. Miraculously the sun began to reappear and the effect was magical. 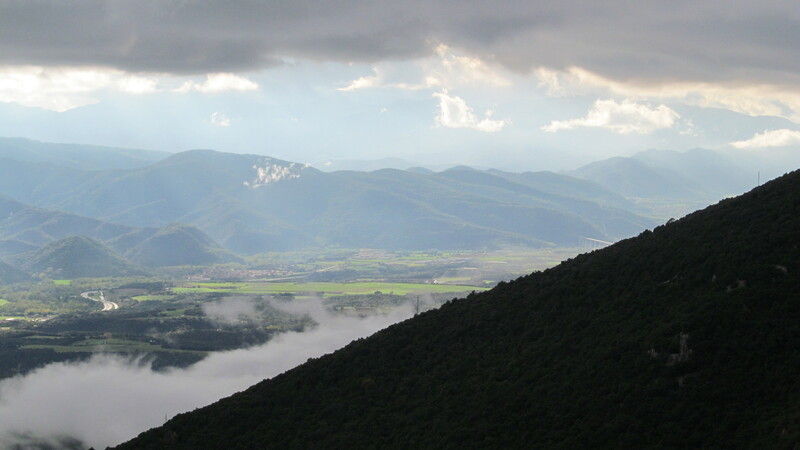 The valley floor, 1000 metres below, would appear out of the mist, below layers of the ominously dark clouds. A transcendent effect – hard to capture. It was also constantly evolving, changing, transforming. On the descent after lunch, we stopped to visit the ruins of the original monastery, constructed in the 10th century, somehow at 900 metres above the valley floor, this one not quite as removed from the world of sin, but what was much more fun was our own search for wild mushrooms along the road. We would spot, stop, jump out and collect. Here is Alberto’s pride and joy! 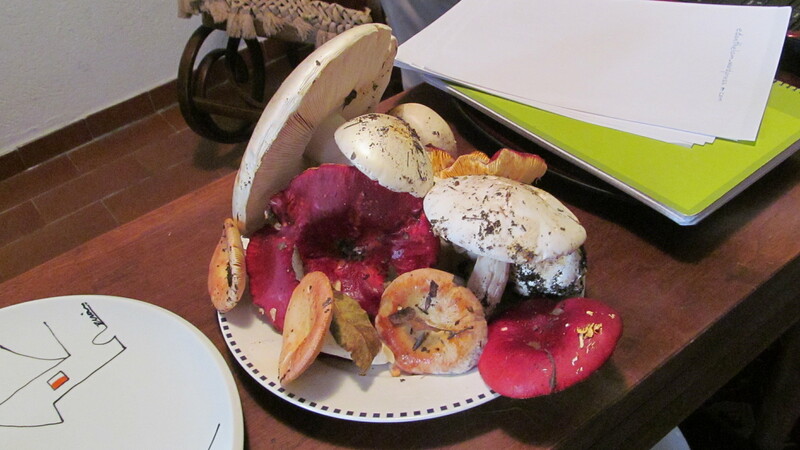 We had quite a harvest in the trunk, with some with wonderful red and orange tops; even I got in on the excitement. But alas! the verdict from a young man in the town was that they were all malo – inedlible, dangerous. But who cares? we were thoroughly enjoying ourselves in the quest. This is the improvised sculpture in their home when I visited for coffee and conversation the following morning. 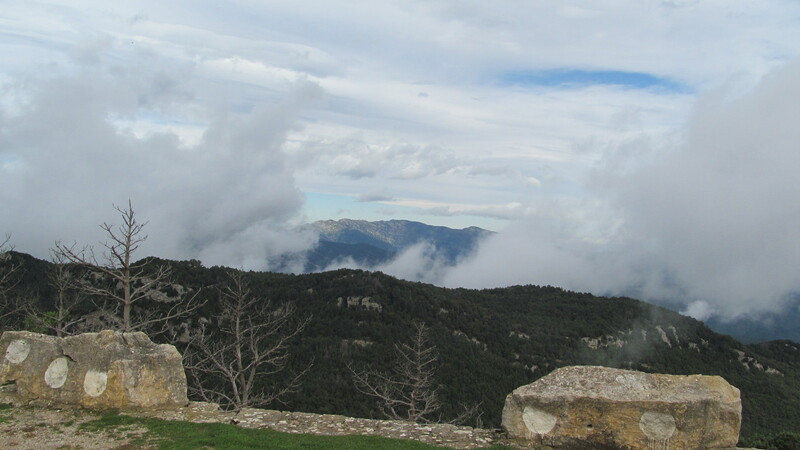 A final photo and video to try to give some idea of the beauty of this part of Spain on this particular day with the mixture of weather, of brilliant sunshine and constantly changing cloud formations and the interplay between these elements, not to mention the brief hailstorm on the way down. First the photo, then the video. I am enjoying doing this; it has become what I do during siesta in the late afternoon. I am also enjoying your comments. Just scroll below. Muchas gracias a Alberto y Duván! It should open at a series of drawings; simply by clicking on the thumbnails, you can enjoy some of his work. The very first one, of Don Quixote, is the one I brought home in the spring. In the list to the left, you can click on pinturas to see some of his canvases, esculturas – his sculptures, arte digital – should not need a translation, and procelanos – pottery. 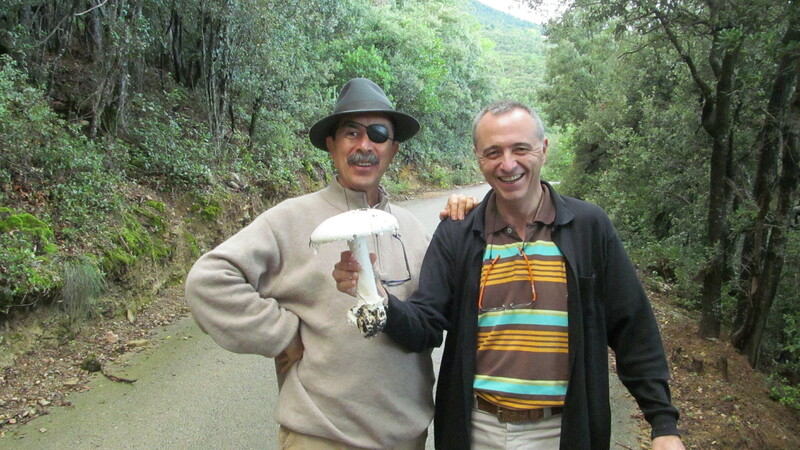 A friendship, from last spring, strengthened during these few days, which will draw me back to Spain. This entry was posted in Uncategorized on October 28, 2012 by agnotarte. Memory is such a curious ‘thing’. I can at times quickly remember the most irrelevant trivia, some birthdays and where I have left my glasses. At the end of September, I organized my visit to family in Ottawa so that I would be back for a much anticipated friends’ end of summer barbecue (primarily of David’s Chinese delicacies), only to forget to show up. Dear friends – so forgiving! And a beloved nephew is still unsure of how beloved I am after forgetting to bring a sincerely requested apple pie (which I did make) to dinner at his home. Oh well, I do, for whatever reason, have a great geographical memory. 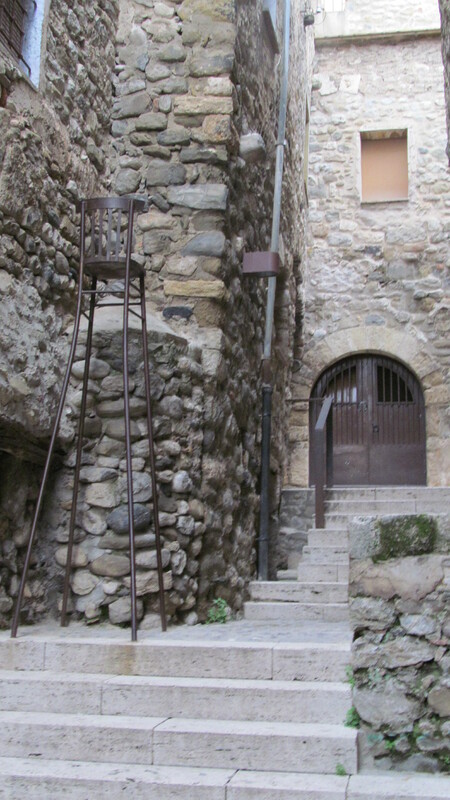 I returned today to the town of L’Escala on the Mediterranean within an hour of Besalú. 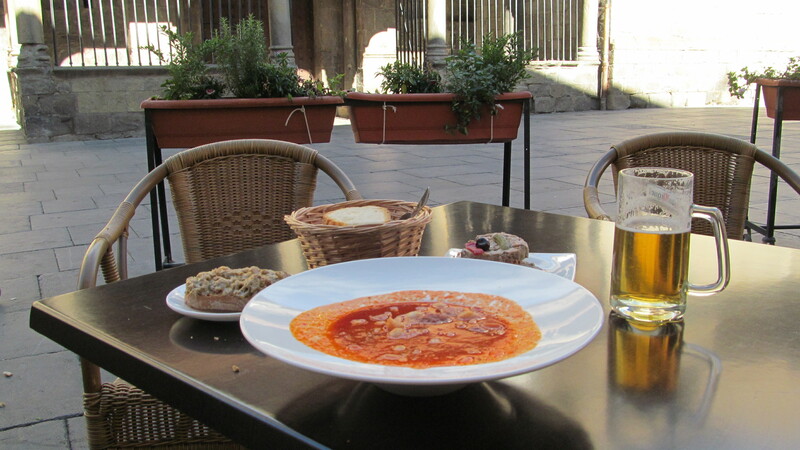 I was here in April, discovered those two sculptures of La Sardana, featured in my first two posts, and ate a memorable lunch: a plate of mussels in a savoury sauce and a dish of paella marinera. 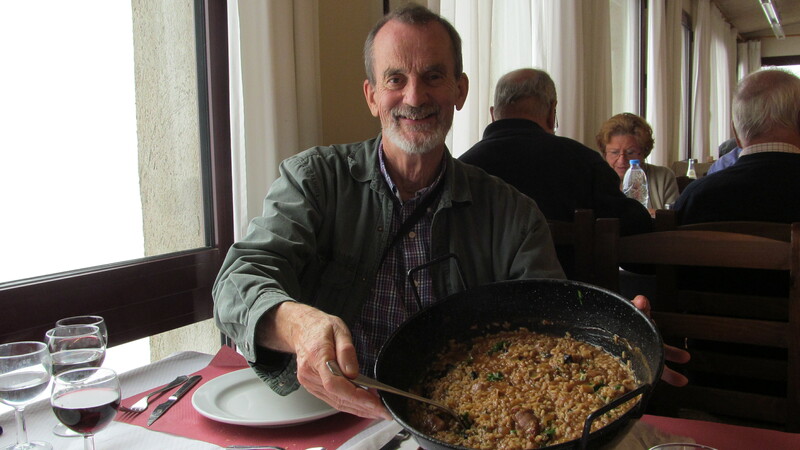 I told the young man serving that I was really indifferent to the typical paella in Spain, paella valenciana, the one with saffron rice. 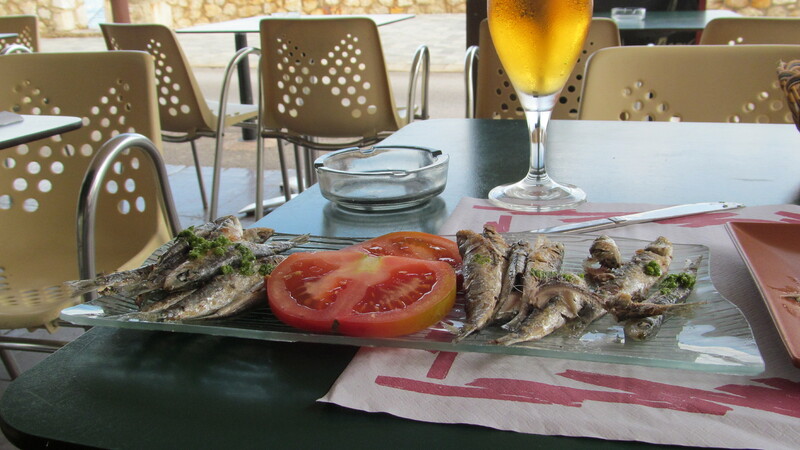 He recommended the local variation, very dark, very savoury, full of seafood, absolutely worth returning for. I remembered exactly where the restaurant was, overlooking the sea, and the young waiter. And, he remembered me, charming young man. I don’t really believe that he was making it up. We had talked quite a bit together in April. Now for the photos and minimal narration. 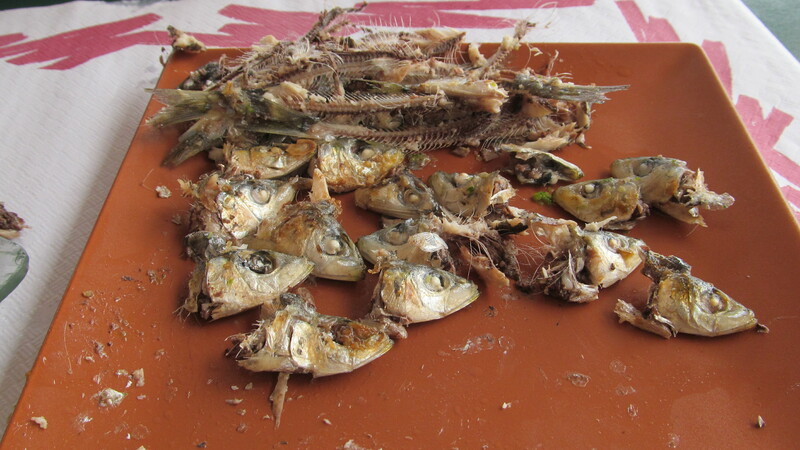 First course was a plate of 15-16 fresh grilled sardines, complete with their heads. I did justice to the plate, without any help. Step by step becoming a Spaniard. 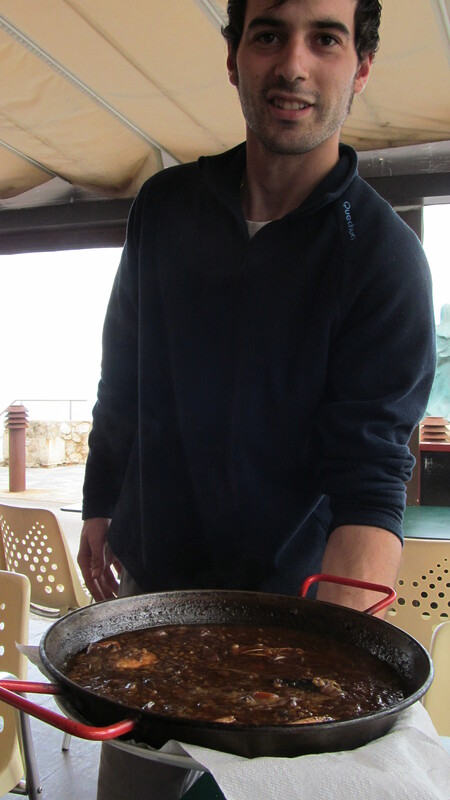 Here is Isaac presenting me with the paella marinera – it’s dark colour comes from cuttlefish ink. In Spanish, the fish is sépia. You can see the English word for the colour of early photographs. 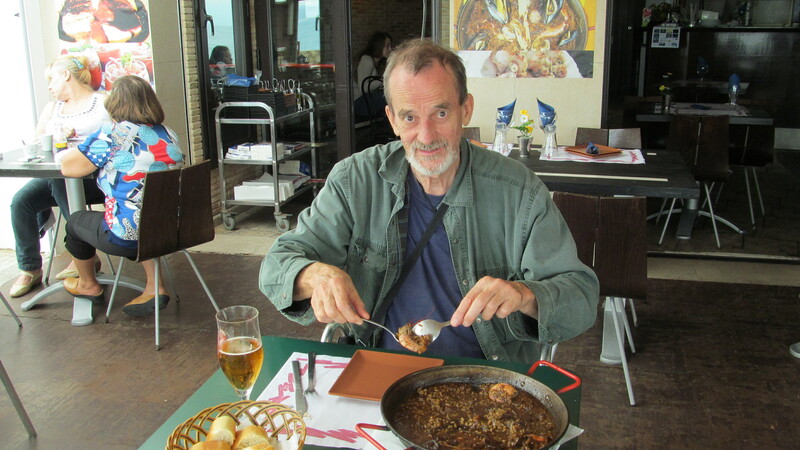 It was full of seafood – large mussels, two large prawns and calamari galore. During the meal, bags of mussels etc were being delivered, from this day’s catch. 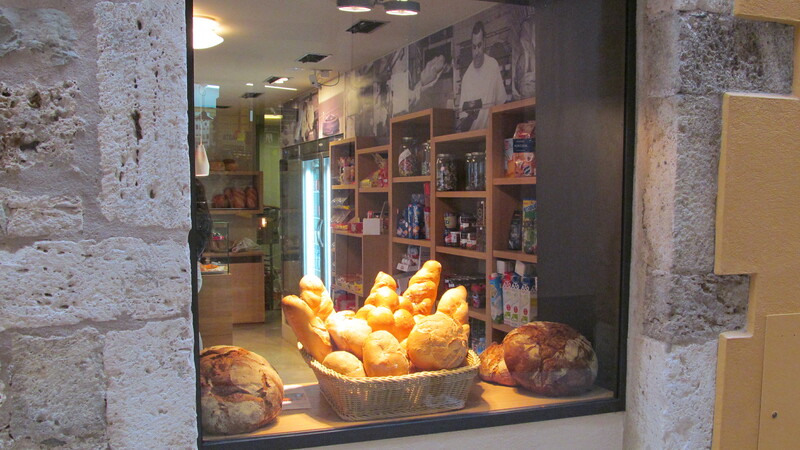 Isaac explained that L’Escala is still primarily a working town depended on the harvest from the sea. Tourists do come, but it is clearly not a tony Mediterranean resort. Definitely why I came back. Thank heavens that the dishes and the young server are photogenic. It’s 6pm, I’m in my hotel. I do think that I will need a long walk before the restaurants re-open for supper at 8:30. This post could have been about last evening’s supper, an amazing risotto with wild mushrooms and local sausage. But the server was not nearly as charming! This entry was posted in Uncategorized on October 26, 2012 by agnotarte. 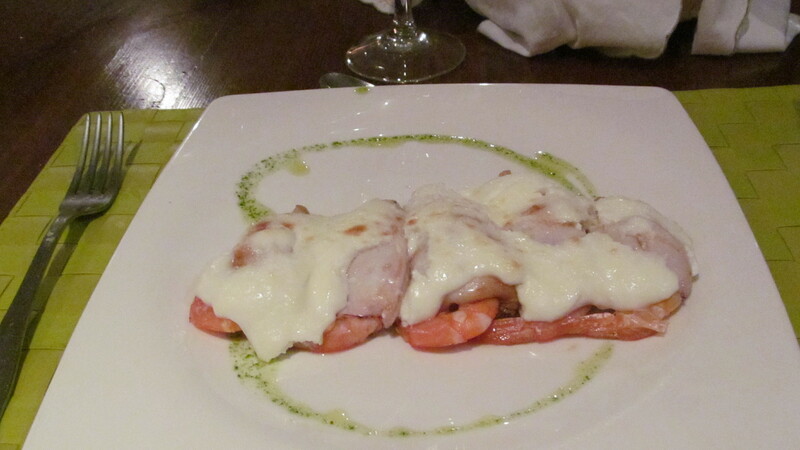 I have come to Spain, drawn by the medieval architecture, Francisco Goya, the food, the people, the geography, and futbol. 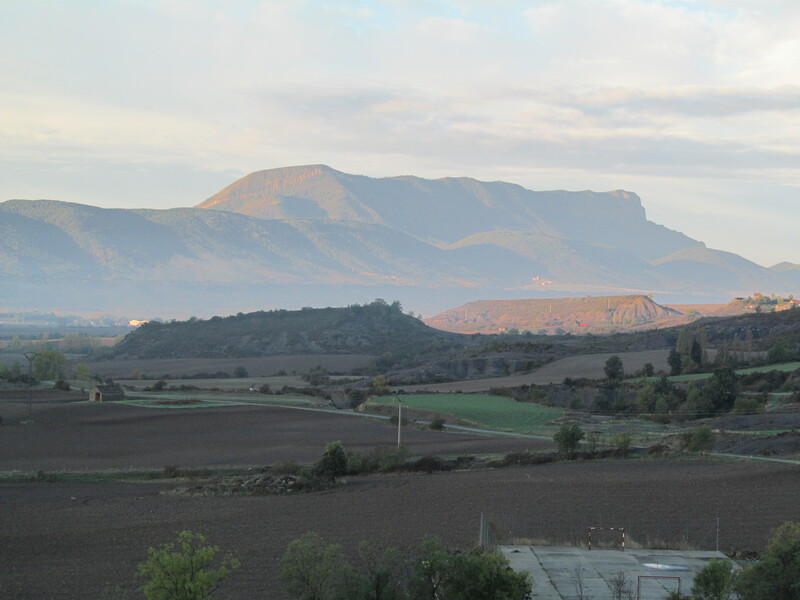 I have come to the small ancient city of Huesca, in northern Aragón, on the outskirts the ruins of its castle rising against the background of a formidable wall of mountains. It has been raining for days. I plan to go to a second division league game here, the hometown team against Barca B, the young stars in the making for El Barca. I find the stadium hours before the game and watch them working furiously to remove water from the field. I return later, buy the best ticket in the house (well under the roof – I am not that tough) and hang out a bit. The Barca team bus arrives. Then, a very vocal group of Barca fans also shows up, having driven for hours to get here, singing raucously, culés, as they are affectionately known. Catalan comes from an old variation of French and so you might recognize the French for backside (or something less polite) – that’s right! In the early days of simpler stadia, the working class would have sat on open metal-slatted seats, and from below, their culs sticking through the slats. Probably used in a derisory way originally, it is now worn with pride. I timidly approached them, introduced myself as a culé canadiense, and asked them to sing el himno de barcelona, sung by the tens of thousands at Camp Nous at the beginning of each match. You might hear my less than dulcet tones as I joined in on the final repetition of Barca, Barca, Barca. I took my seat, the field only had a half dozen puddles, it was once again raining, but lightly. The players came out a half hour before the game to warm up and their routines was wonderful to watch, to see the high level of skill. 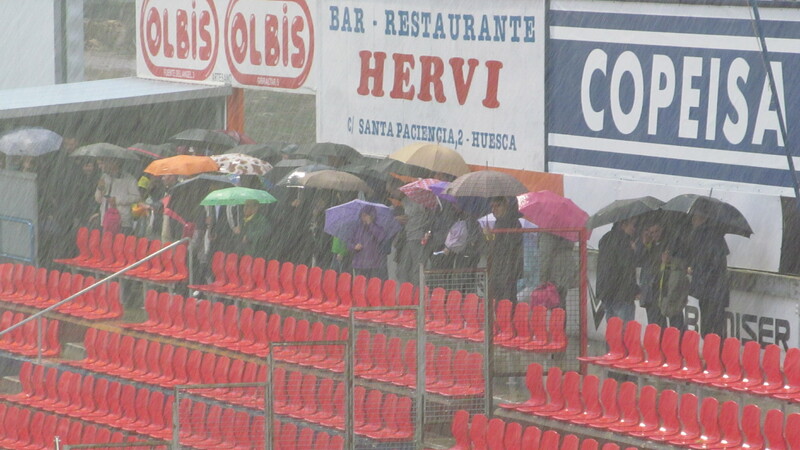 But I am not exaggerating when I say that it began to rain torrentially, with high winds coming from the south. Here is a photo of the devoted end zone fans huddling under umbrellas. It will give you some idea of their devotion and lunacy. The few puddles that were visible when I had arrived grew almost exponentially after an hour of very heavy rain; virtually half the field was clearly underwater. Even earlier on, when the players were warming up, often they were splashing on what appeared to be somewhat drier puddleless grass. The ground was absolutely waterlogged. Throughout the area, there was serious flooding, damage and road closures. The game was cancelled. I did not have the chance to fully experience a rainy Tuesday night in Stoke. This entry was posted in Uncategorized on October 23, 2012 by agnotarte. Rain – forecast it seems for a few more days – we are definitely up in the foothills of the Pyrenees, and not ‘on that plain, in Spain!’ They have had drought conditions with serious forest fires all summer long. They need the rain badly and the whole of Europe is being soaked. I headed south after an enormous breakfast to the ancient (it almost goes without saying) town of Graus, known internationally for its embutidos, sausages, fresh and cured. The video is of their main square, plaza mayor, the focal point of every city, town and village. This one has been recently restored. The frescoes echo back to the 16th century when this style was imported from Italy. 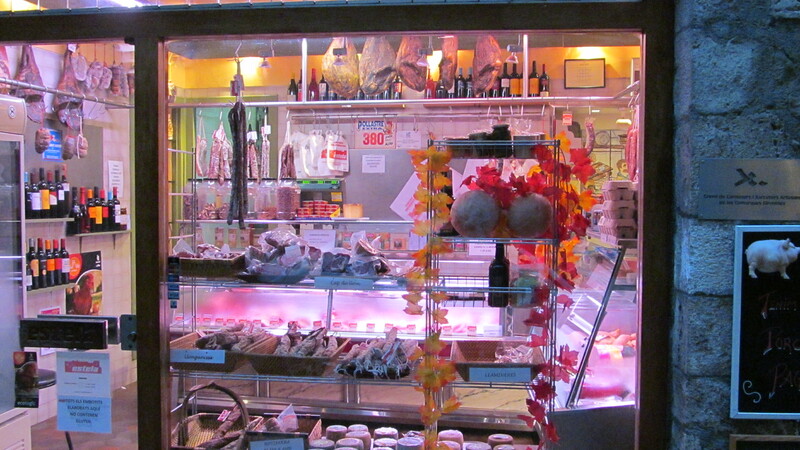 The final shot is of a butcher shop, carnecería, as in carnal, of the flesh. The town spreads out in innumerable narrow lanes, without any overall plan, a direct link with the medieval origins of the place. The Spanish do their restorations very well. I headed north again beyond Roda to the 11th century monastery of Obarra (with earlier Visigothic roots). The weather was closing in, the clouds thickening, darkening, threatening and finally thundering, una tormenta. My spirit was very calm, definitely not tormentado, with my head protected by my cowl (my hoodie) and tonsure as I made my way through the forest pathway – felt quite medieval. I took this photo a bit later when the weather was clearing. I am now going to try to give you a link to quite a collection of photos of Obarra from the internet. It will give you a sense of the wall of mountains which rises directly behind the buildings. May it work, or simply google – monastery of obarra – yourself. The gorge of Obarra, rising up behind the monastery, was at times not more than 10 feet wide (the road had been carved into the left side of the river), with some walls rising easily 100 feet. 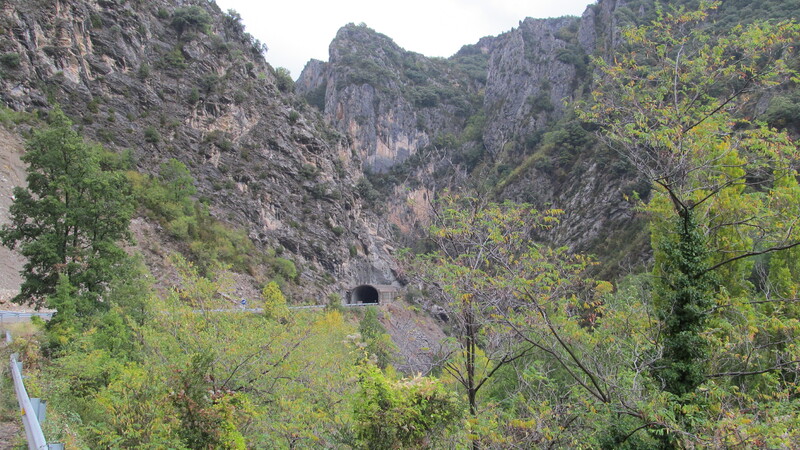 Many tunnels and 9 kilometres later I went over the Pass of Bonansa, at 1380 metres, moving closer and closer to the Pyrenees themselves. The monastery is tucked down to the right in the photo. 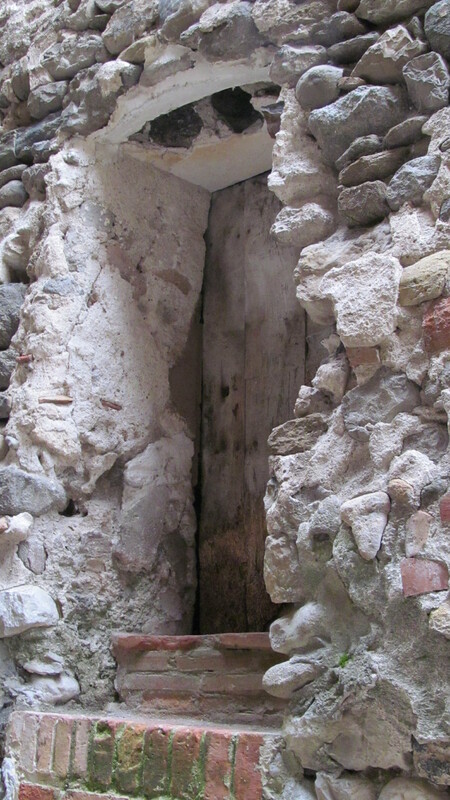 The original trail through the gorge would have connected with others to eventually connect Spain beyond the Pyrenees to the vast number of other Benedictine and Cistercian houses spread across Europe. This house would have been Cistercian, noted for their austerity, simplicity, poverty, and a life of prayer and work, the distant opposite of those houses which justifiably had provoked the Reformation. The Cistercian movement had itself been a reformation within the church. Enjoy. I am heading further north and to the west in the morning. 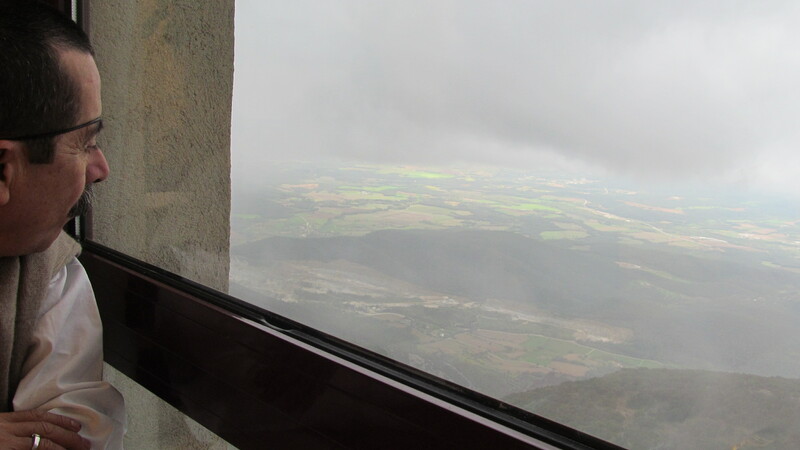 In making it to Jaca, often in heavy rains, I had the pleasure of traveling through two other stunning gorges. This entry was posted in Uncategorized on October 20, 2012 by agnotarte.